We woke up to lots of snow this morning, but undaunted we're heading for lunch with friends at the Methodist Church in Nevada City. Rosemary's been telling me about the church's wonderful once a month lunch, and today's the day. Sue let us off at the church while she finds a parking spot. Entrance to the buffet is at the left side of the church. At our table from the left...Sue, me, Mel, Toby, Rosemary and Charles. Besides good food, our get together is wonderful. Very interesting and talented people. Rosemary brought lots of pictures of family and friends to look at...including one with Huell Howser when he was filming for his television show that aired last night. Rosemary not only plays violin with the Rough and Ready Fruit Jar Pickers, but also writes her column "Rough And Ready Rambling" for the Penn Valley Courier. 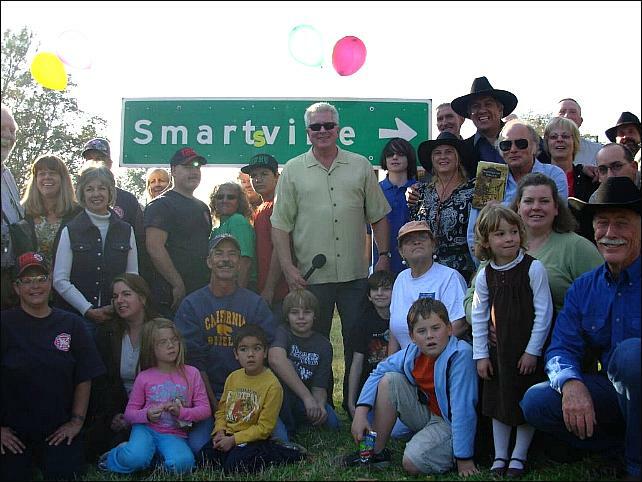 In Huell's photo below, she's wearing the white shirt and cap. We were the first ones here and the last to leave. The time really fly's when you're having fun, and today was a winner. We're going to do it more often.